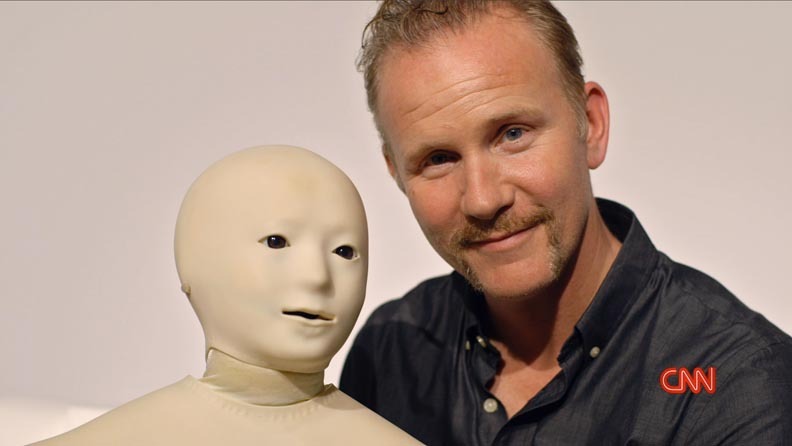 Popular CNN Original Series Morgan Spurlock Inside Man, hosted and produced by the Oscar®-nominated documentary filmmaker, moves to Thursday nights in its third season on CNN, beginning January 22 at 9pm ET with an inside look at the mystery of robots and artificial intelligence. In his inimitable, inquisitive style, and with a sense of humor intact, Spurlock tells compelling stories from an insider’s perspective as he tackles topics that include America’s trash epidemic, the future of zoos, living on bitcoin, dating in America, and medical tourism or traveling internationally to get the best medical care. MorganBot (Jan 22) – In the season three premiere, Morgan attempts to harness the power of robots and artificial intelligence in order to stay in control of his busy life. Spurlock travels from Japan to California to explore the possibilities of a fascinating and potentially frightening world in which robots make autonomous decisions, allow people to be in two places at once, and serve as virtual helpers in a work environment. Club Med (Jan 29) America’s exploding medical care costs, system complexities, and inefficiencies lead Spurlock to an investigation of the burgeoning business of overseas travel for medical treatment. He takes his shoulder injury from a New York City doctor to Bumrungrad Hospital in Bangkok, Thailand looking for a better alternative. Morgan See, Morgan Do (Feb 5) – Spurlock explores our nation’s zoos from both sides of the glass, to get an insiders perspective on the future of these attractions. He joins the staff at the Detroit Zoo, examines the educational benefits provided to the visitors, takes part in the compassionate care of the animals, but also looks at the long-term effects of keeping them in these restrictive environments. Morgan the Matchmaker (Feb 12) – In a quest to discover how people find love in the 21st century, Spurlock tries his hand as a matchmaker and reports on the many online dating sites and apps at our disposal, including Three Day Rule, OK Cupid, and Grindr. But do these modern tools actually make it easier to find love? Morgan Makes ‘Cents’ Out of Bitcoin (Feb 19) – Morgan lives off of nothing but the e-currency Bitcoin for a week to figure out whether the world is ready for a new kind of money. With all of the misinformation and misunderstanding surrounding bitcoin, Spurlock is determined to understand the pros and cons of the peer-to-peer digital currency and what its effect might be on the global economy. United States of Trash (Feb. 26) – Morgan follows his own trash to see what throwing something ‘away’ really means. Spurlock gives viewers an inside look into the waste management industry, from the ins-and-outs of garbage collection with the New York City Department of Sanitation, the trek from local trash to landfills, and the trip taken by his own e-waste. Honey, Bee-ware (Mar 5) – Spurlock gets to the heart of the mysterious disappearance of the honey bees by becoming a commercial beekeeper in order to explore the causes and devastating effects on our entire food system. Morgan also uncovers a web of international honey laundering schemes that have him questioning if we really know where our honey comes from? Ranger Spurlock (Mar 12) – Spurlock gets back to nature as a volunteer park ranger in Alaska, and is joined by his young son Laken in an immersive look at the viability of America’s national parks in the 21st Century in the face of a changing world. Viewers are invited to follow, engage and interact with Inside Man and each other using hashtag #InsideManCNN and handle @InsideManCNN on Twitter and at Facebook.com/InsideManCNN. In addition, the show blog CNN.com/InsideMan, will provide users with program information, behind-the-scenes photos and videos, and other special content. An acclaimed documentary filmmaker, Spurlock came to international prominence in 2004 with his Oscar® nominated film Super Size Me. He made his first foray into television as executive producer of the FX series 30 Days (2005-2008). In 2013, he served as director of the 3-D concert film for the mega-hit band One Direction, and earlier as executive producer of the documentary series A Day in the Life on Hulu, and the films, Comic-Con Episode IV: A Fan’s Hope, The Dotted Line on ESPN and Mansome on Yahoo! Warrior Poets is a New York based production company founded in 2004 by Academy Award® nominated filmmaker Morgan Spurlock. Since its creation, he and producing partners Jeremy Chilnick and Matthew Galkin have produced multiple award winning films and television programs. Films include One Direction: This Is Us, POM Wonderful Presents: The Greatest Movie Ever Sold, Comic-Con: Episode IV – A Fan’s Hope, Mansome, Where in the World is Osama bin Laden?, and Freakonomics. Television projects include the award-winning FX series 30 Days, the IDA award-winning CNN series Morgan Spurlock: Inside Man, Showtime’s 7 Deadly Sins, ESPN’s The Dotted Line, Emmy and Writer’s Guild nominated The Simpsons 20th Anniversary Special in 3D on Ice!. Digital projects include Hulu’s A Day in the Life, Yahoo’s Mansome, Failure Club, and Losing It with John Stamos, and Sky Atlantic HD’s Morgan Spurlock’s New Britannia. CNN Worldwide is a portfolio of two dozen news and information services across cable, satellite, radio, wireless devices and the Internet in more than 200 countries and territories worldwide. Domestically, CNN reaches more individuals on television, the web and mobile devices than any other cable TV news organization in the United States; internationally, CNN is the most widely distributed news channel reaching more than 286 million households abroad; and CNN Digital is a top network for online news, mobile news and social media. Additionally, CNN Newsource is the world’s most extensively utilized news service partnering with hundreds of local and international news organizations around the world. CNN is division of Turner Broadcasting System, Inc., a Time Warner Company. *Source: The Nielsen Company, Sun 10p-11p, Season 2 Average = 4/13/14-6/8/14 excluding 5/25/14, Live+7 data stream. Median age based on P2+. ** Source: The Nielsen Company, Sun 10p-11p, Season 1 Average = 6/23/13-8/25/13 excluding 7/7/13 and 8/4/13, Live+7 data stream.